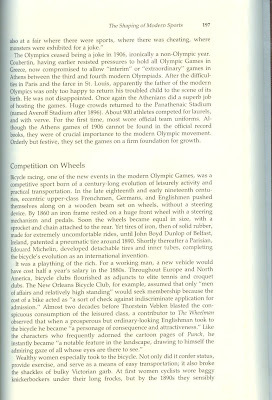 Here are three pages from an old book called Sports in the Western World by Willian J. Baker. 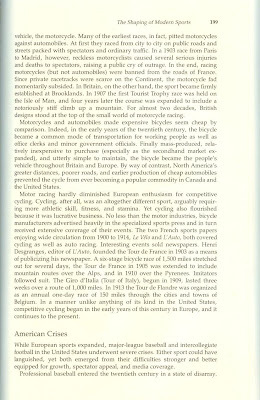 The cycling boom was really a systematic process that came with money, leisure and wealth as much as from significant industrial innovations such as the pneumatic tire. 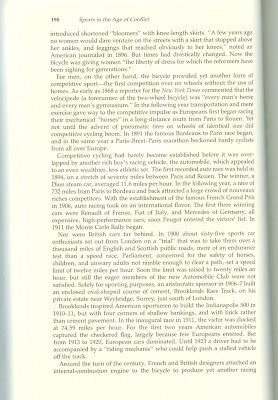 The new race on "mechanical" horses with wheels was seen as an avenue to explore. It was fun, exciting and with the fervor of a few, it was preserved for later generations. It makes me think about what the view of our current day sports will be in about 50 years. It's certainly a short time in the big picture but with all that's going on with equipment development and drug testing.. I'm sure it will be interesting.